The aim of this project is to build a hand cranked Marx Generator for display purposes. Where someone can wind a handle a few times and a loud bright snap of lightning ~10cm long accompanied with a cascade of 20 smaller spark gaps flashes at the same time. An interactive, dangerous and loud electricity display. 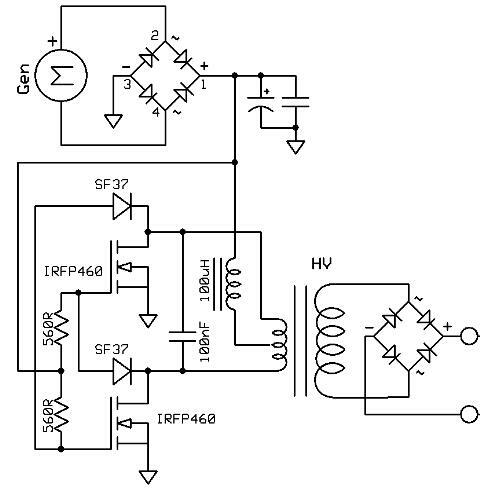 A Marx Generator is a very simple and old circuit first described by Erwin Otto Marx in 1924. 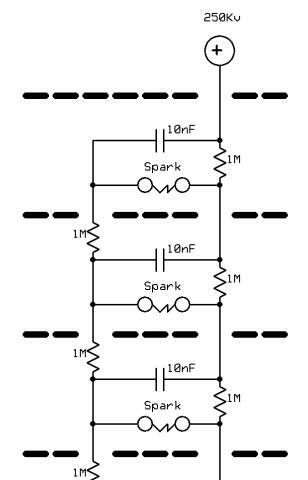 It generates a very high-voltage by charging a cascade of capacitors wired in parallel, then suddenly connecting them in series using spark gaps. Air breaks down at about 30kV/cm depending on humidity and temperature and when the arc forms it is virtually a short circuit and this is used to join the capacitor in series. The generator in this case will be a 200W 24V DC Motor with a gearbox.